Edit: I've updated this blog post to provide the direct link for the kit + a few more details. Enjoy! 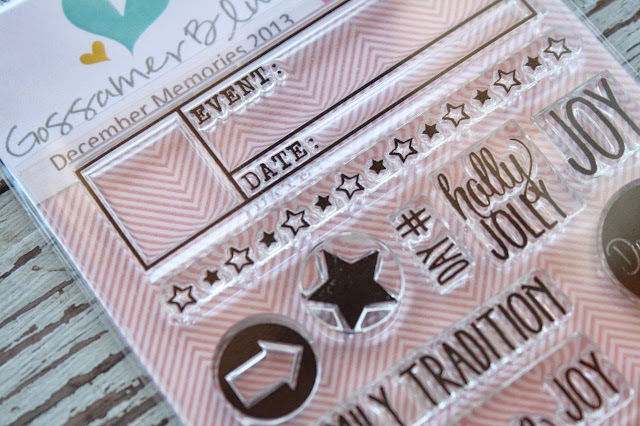 It's what a lot of us have been waiting for....the Gossamer Blue 2013 December Memories Kit. The photo below shows the kit in it's entirety. 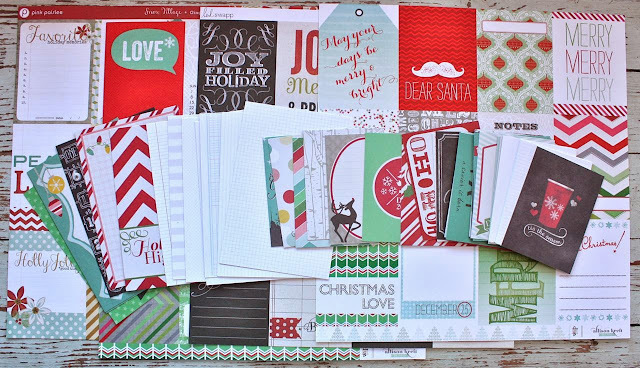 It's a big one, friends, jam packed full of wonderful holiday supplies to create your own December Daily type album. 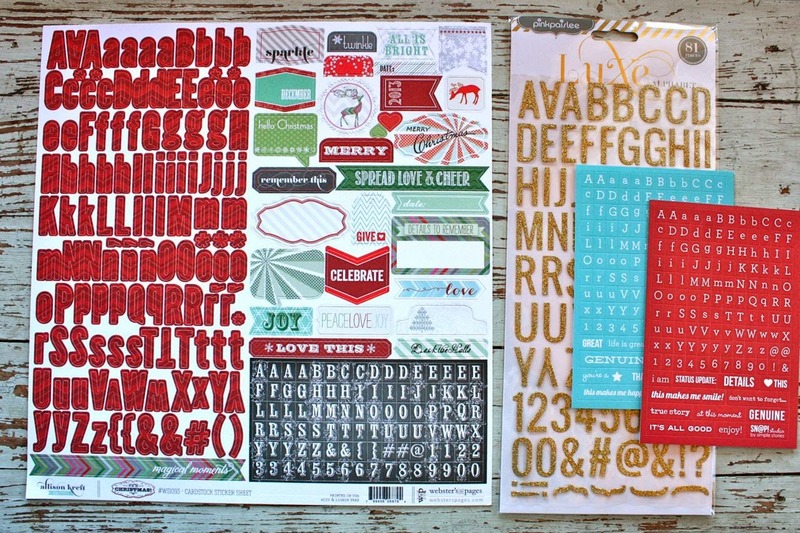 Details: The kit is up for sale early today to Gossamer Blue subscribers. Remaining kits will be up for sale tomorrow at 12:00 Noon PST. The price for the kit is $99.95. A complete kit description and more details + additional photos of the cut files and printables will be available at the Gossamer Blue site tomorrow. There will be a class for this kit that begins on November 1st. Kits did sell out last year so I advise not to wait too long if you're interested this year. Kits start shipping on Monday, October 14th. This year's December Memories kit comes with a Studio Calico Handbook. I love red for the holiday season so this one is just right. It comes with some pages & extra inserts are included too. Plenty to do a full month of December. I haven't opened all my inserts yet but I believe there are about 32 page protectors in various sizes. 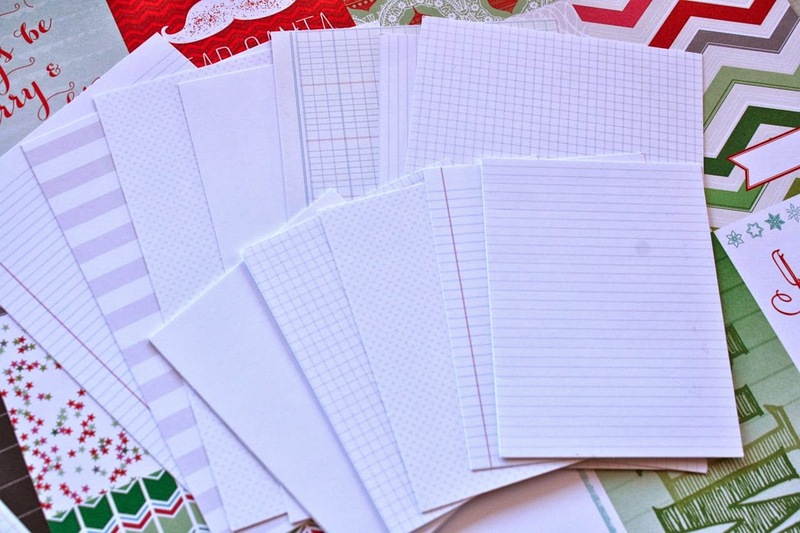 These are the 12 x 12 papers. I love each and every one of them. You get traditional holiday colors with the wonderful aqua color added in. It's kind of that robin's egg blue which is my favorite color. These are my three favorite patterns. I love, love that floral design because it's so unique. 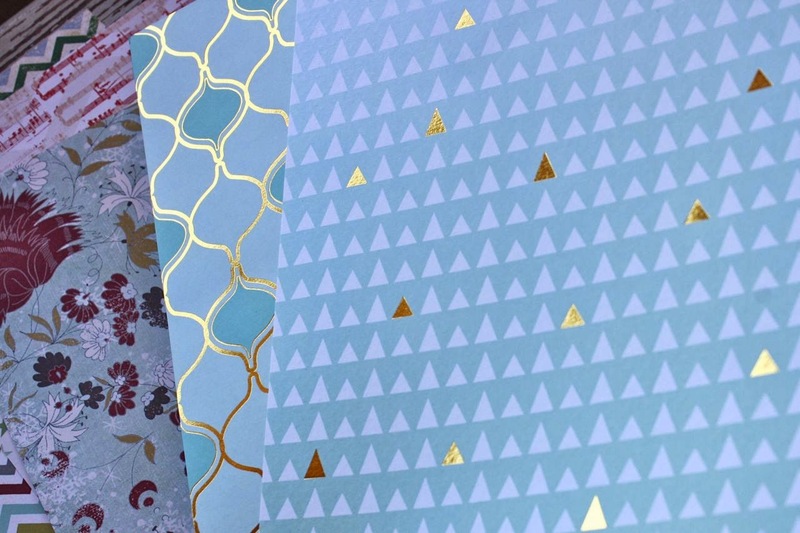 The other two papers have gold foil accents which are so striking in person. The kit is full of the gold foil accents, exactly what I was hoping for this year. This photo is not stellar but I have to share...there are transparencies and pretty gold and silver translucent papers in the kit. These are always fun for mini albums. 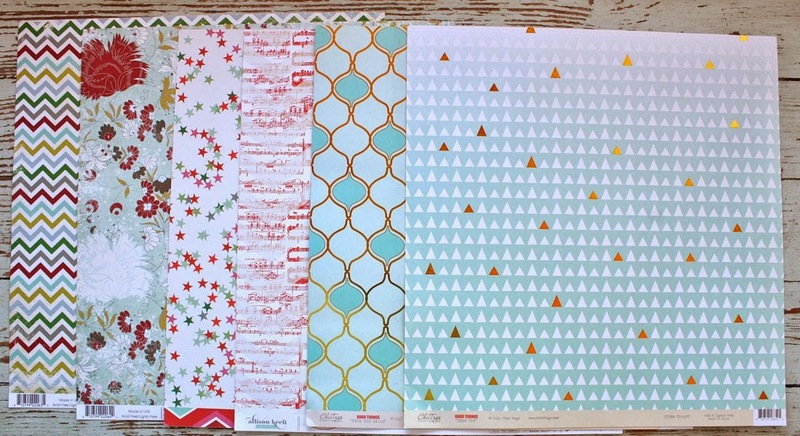 The bottom one is full of 3 x 4 size designs that be cut apart for individual inserts..or maybe a 6 x 8 insert, etc. 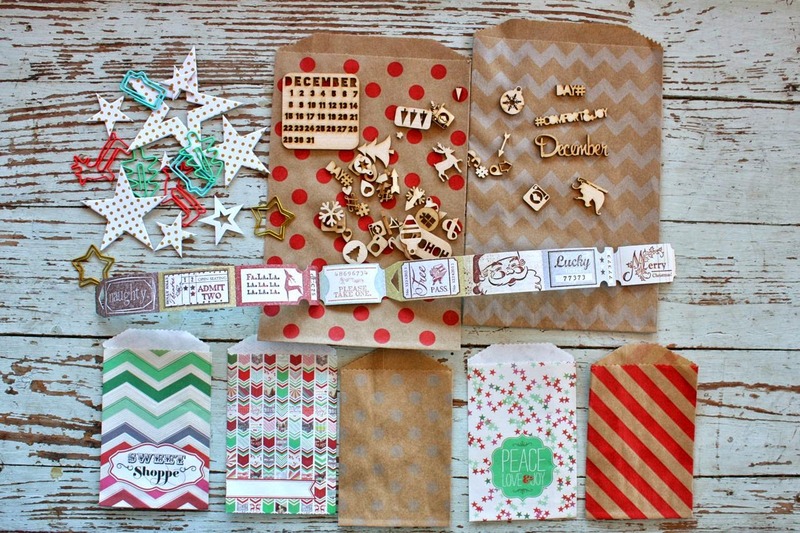 I'll probably make some pockets of out some, maybe adding holiday confetti in here and there. 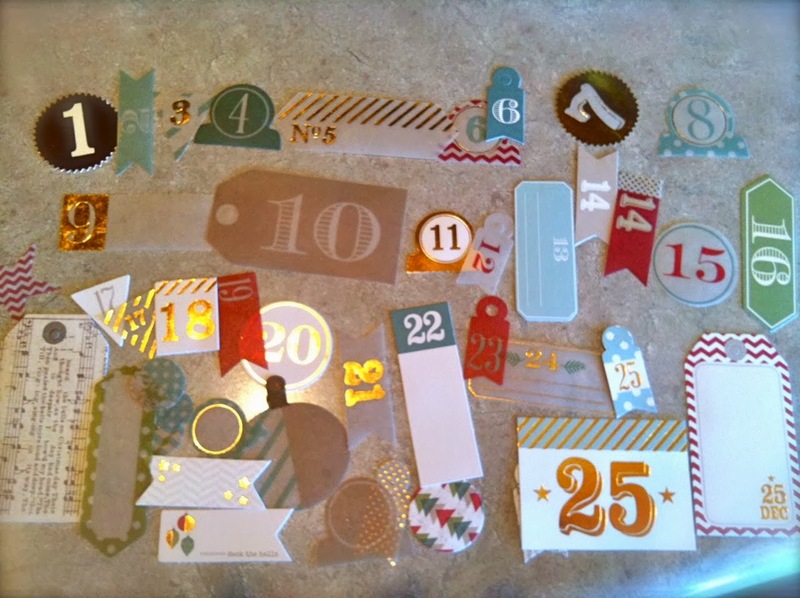 Note: I might just be able to hook you up with holiday confetti....I'm working on my Noel Notions for my shop again this year. There are a ton of 3 x 4 and 4 x 6 inserts. 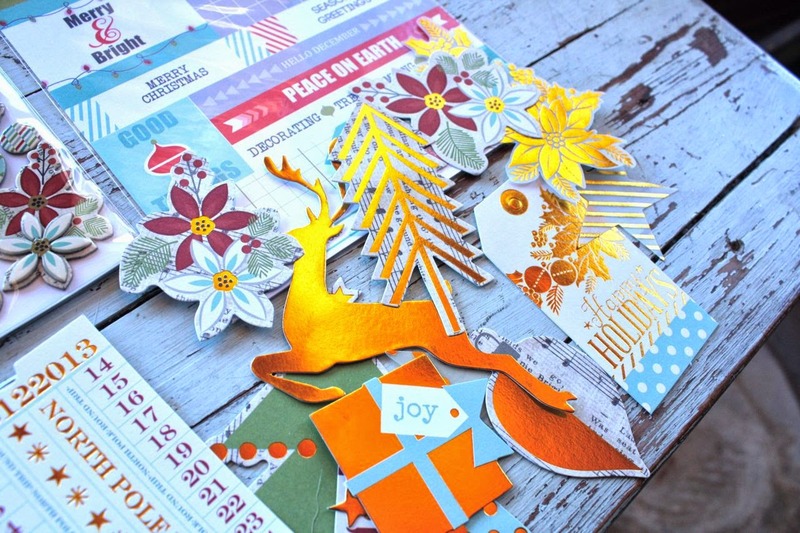 The individual ones you see spread out are designed by our wonderful Gossamer Blue graphic designers. All have vertical and horizontal orientation, depending on which side you use. The one on the right with the coffee cup, hello! So cute. What I love about these is that they coordinate with the other kit items so wonderfully. This entire kit was meticulously hand picked by Lori and it is fantastic, you guys. If you worry about getting your money's worth....it's worth it. There is something to be said about one stop shopping and this kit does the trick. It all coordinates and comes in one box. Done. Easy. Less stress. That is worth a lot, right? Oh, the bottom 12 x 12 sheets are full of even more journaling cards that you can cut apart. See these? I'm so excited about these cards. 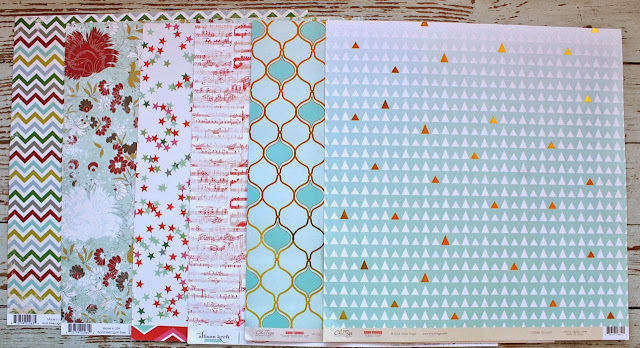 I approached Lori about getting some patterned journaling cards in 3 x4 and 4 x 6 sizes and here they are. Our graphic designer did a great job with these. Horizontal and vertical orientation. We all want plenty of alphabets in our holiday kit, right? 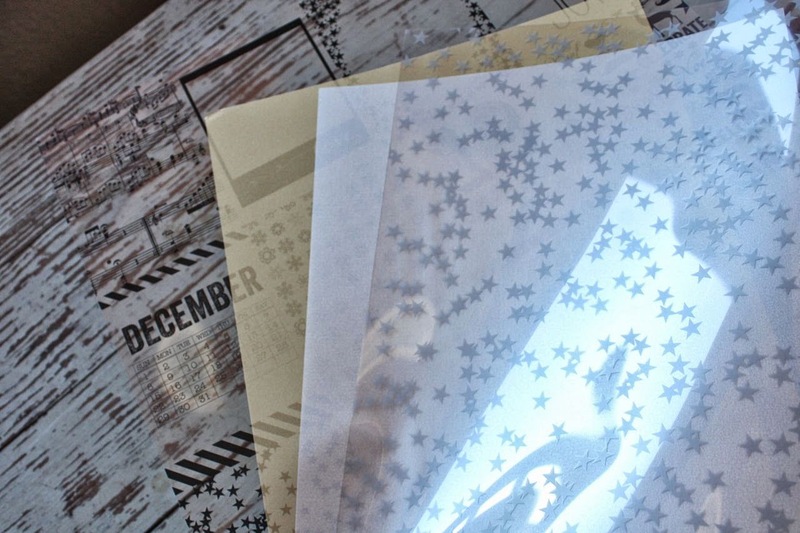 You get 5 total alphabets with this year's December Memories Kit. Two red, one gold shimmer, one aqua and one chalkboard. Woohoo! 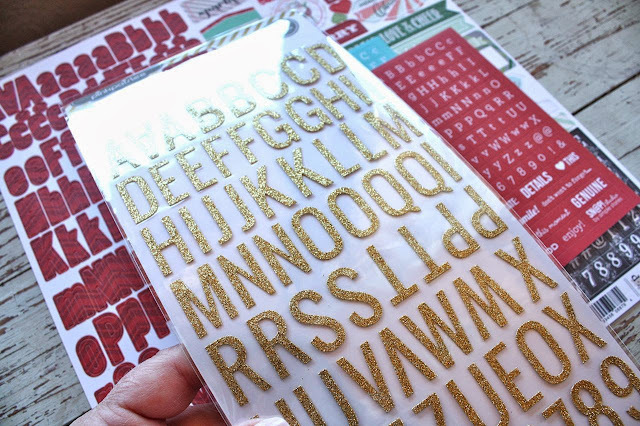 Totally photo worthy is this gold shimmer alphabet. It's going to look stellar with all the gold foil accents. 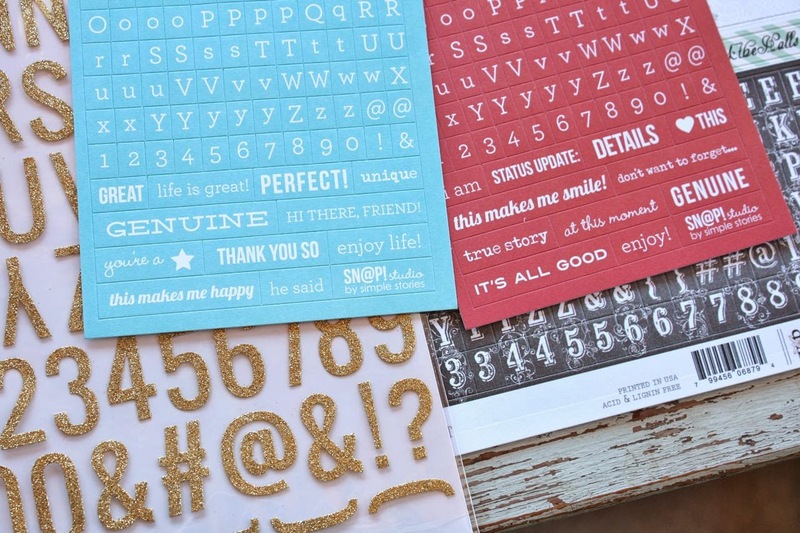 Embellishments are plentiful in this kit. Just take a gander at all of these below. If I was shopping for kit, all of these would be tossed into my cart. So much more beautiful in person too. Some are flat, some are dimensional. I plan to organize all of my kit products into some fun, vintage boxes so stay tuned for that in an upcoming blog post. It's so hard to photograph anything with gold foil so please ignore the weird colors below. These are some of the accents that I layed out for you to see....so pretty and shiny. I love the woodland accents of the deer and trees. Here's my favorite embellishment package. Look at that robin's egg blue color...the candy cane...the poinsettias. So pretty and with such dimension. I usually try to keep my regular Project Life pages flat but with a mini album, anything goes! You might consider adhering these to the outside of the page protectors so you can feel the dimension. I'm a button lover so I was happy to see these two packages. You get chipboard, regular buttons and lots of fun shapes. 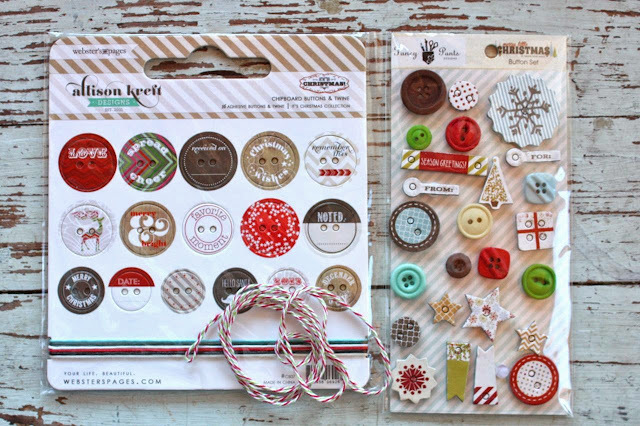 There's even some holiday twine to tie the buttons with....don't leave your buttons naked, okay. Have fun packaging up lists and receipts, extra photos,etc with all sorts of cute sacks. Oh gosh, these are fun. See that wood veneer? That's an exclusive for Gossamer Blue. So excited for that. Paperclips just make me happy. 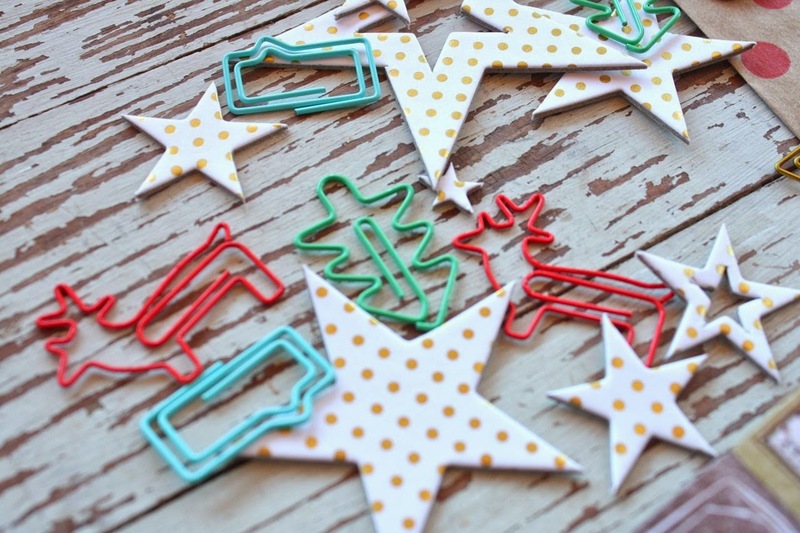 I'm loving the deer again + there are more gold foil dots on those chipboard stars. Totally cruddy photo here below because these were spread out on my countertop with poor lighting. But a very important factor.....the kit comes with numbers from 1-25. 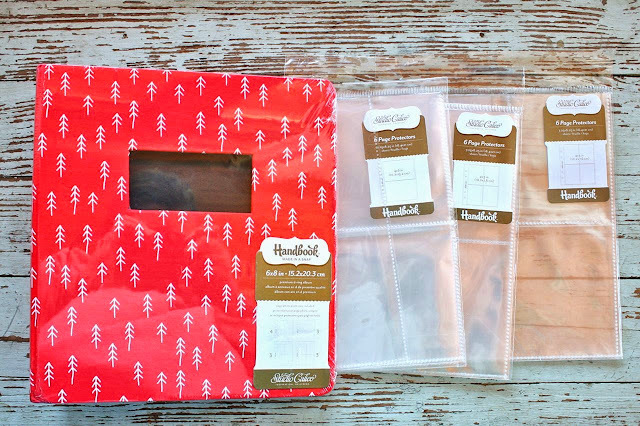 I know this is a big question with holiday album kits. You can see at the bottom left, there are lots of other little blank accents where you can finish off the month to 31 if you want to. I will be stitching over these as they're nice and flat. These four alphabets all have numbers too so you can easily finish off the numbers with kit contents. I worked with Lori and Elle from Elle's Studio to design the stamp set for this year's kit. Great quality stamps and there a lot of images packed into this set. My favorite part is the label at the top. You can stamp one of these right onto a journaling card...or perhaps stamp them onto cardstock ahead of time and trim them out.....then you can fill in the left square with the "DAY #" stamp and add numbers. In the event section you can write or type your daily activity. All of the stamps in the row with the star fit into the left square of the label. A regular office supply date stamp fits into the "DATE" section. Fun stuff. Okay folks, there you have it. The whole kit and caboodle. I've shown you the entire kit contents so you know exactly what you'll be receiving when your kit arrives. You. will. love. it. You will. My plan this year: I'll be doing a blog post soon in which I explain why I'm doing a separate mini album this year vs having my entire DD in my Project Life album like I did last year. Just some food for thought. 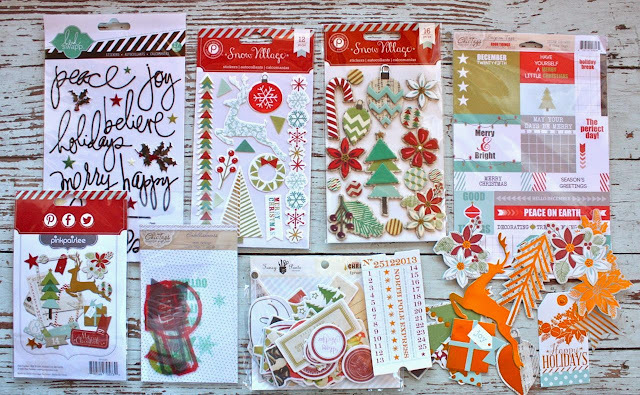 I plan to make my page inserts in advance as much as possible and then for the rest of the kit, I plan to use the items for my regular Project Life so it will have a little holiday feel also....and the rest of the kit will be used for cards and packaging. Be sure to check the Gossamer Blue site out starting tomorrow for updates on the kit, the pricing, how the class will work, etc. I'm so excited now for December. I hope you'll join us! so very excited! thanks for the kit breakdown post, i purchased mine today and was hoping for a more detailed look at all the goodies :) you're awesome! Thanks for the overview! Left your blog in the middle to make my purchase - HA! But I came back... Love that you are involved with the stamp designs. I have been very impressed with the functional designs and the quality (no pun intended). I ordered mine today, and I'm really excited, especially after seeing all these close ups! le sigh. that looks uh-MAZE-ing. Gorgeous! Thanks for the great pictures and details. wow!!!! what a-mazing projects that is in store for you!!!! Wow, that's quite a haul. So beautiful. I am so excited. This is my favorite project! I'm looking forward to the mini vs. Project Life post later. I'm torn between the two this year. 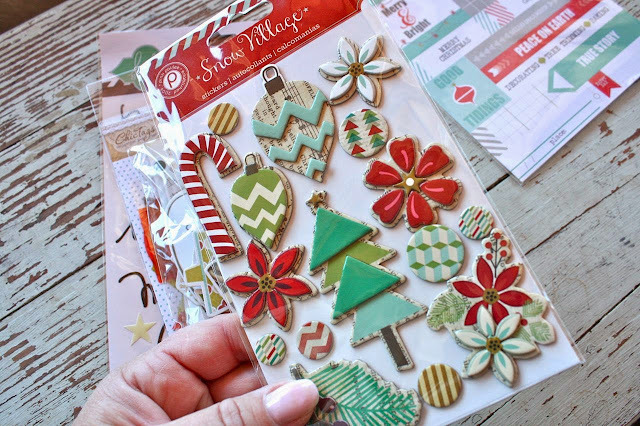 It's my first year doing project life and trying to figure out all year how I'm going to approach DD.